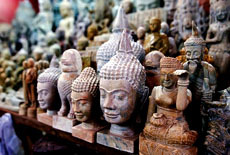 Cambodia is well known for its amazing wealth of natural and cultural treasures, and smiling people. Ruined by three decades of War, this beautiful country once again opens its arms to the outside world. Nowaday, Cambodia is one of the most compelling destinations in Asia, attracting millions of tourists all over the world every year. 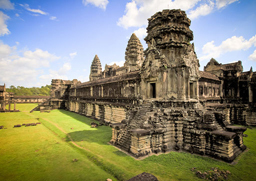 It is most famous for Angkor Temple Heritage Site, the largest architectural complex in Southeast Asia. Representing the peak of khmer civilization, Angkor Wat is considered the symbol of the nation while Phnompenh - the little capital city offers charming setting and tranquil atmosphere. 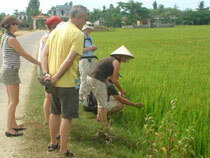 Cambodia's peaceful countryside with endless rice paddies and rows of palms also bring you an unforgettable experience. And with this Cambodia classic tour, we just want to show you that even those simple and laid back things can be a true wonder. Arrive in Phnompenh, meet our guide and trasfer to the hotel. 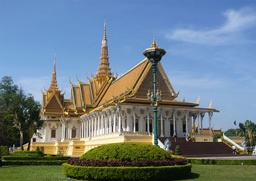 Drive to the city centre to discover Phnompenh - the capital city of Cambodia. 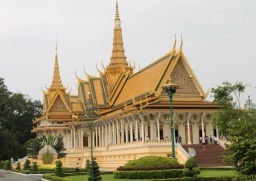 Visit to National Museum then Silver pagoda situated inside the Royal Palace and Wat Phnom considered the spiritual heart of Phnompenh city. Continue visiting Choeung Ek known as The Killing Fields, where the Khmer Rouge regime executed about 17,000 people between 1975 and 1979, Toul Sleng- Museum of Genocide and the Russian market. Overnight in the hotel. Excursion to discover the Tonle Bati Lake- a small lake about 30 km south of Phnom Penh. 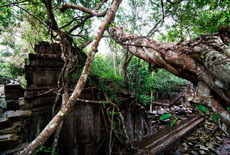 Close to the lake, there is Ta Prohm, a temple built in 12th century by Jayavarman VII and 20 minutes south of the lake there is another temple called Phnom Chisor, a pre-Angkorian Brahmin temple of Suryagiri (10-11th century) that sits on top of the hill (503 steps) and offers fabulous view over the surrounding plains. Back in Phnom Penh and overnight at the hotel. After breakfast drive 168km to Kampong Thom-a picturesque town situated on the bank of the Tonle Sap Lake. En route, drop by Skun market- the unique place selling spider in Cambodia and Kuhak Nokor temple built during the reign of King Suryavarman I (1002-1050). 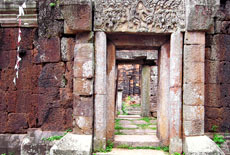 This temple was built of laterite and decorated with sandstone lingtel, fronton, and pillars. Arrive in Kompong Thom, check in the hotel for a short rest. In the afternoon, crossing the beautiful landscape of the Cambodian countryside, we reach Sambor Prei Kuk which was the ancient capital of Chenla built in the early seventh century. Drive back to Kompong Thom for overnight. Start our day by visiting Banteay Srei built at the time when Khmer Empire was gaining significant power and dedicated to Hindu God Shiva. 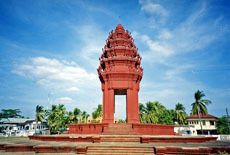 It’s a masterpiece of Khmer Art with small size, sandstone construction and ornate design. We then back to visit Banteay Samre temple in the Angkor Wat style. Start our morning by visiting Beng Melea temple located 60km to the East of the city (2 hours drive). 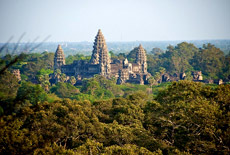 The temple was constructed in same age and style with Angkor Wat. It is hidden in the middle of lush jungle, an ideal place for those interested in getting some adventure off the beaten track in Cambodia. Picnic lunch on the way. We then transfer to visit Koh Keh- used to be the most remote and inaccessible Angkor temple complex but thanks to the reconstruction, the road now is in good condition. Overnight in Siemreap. 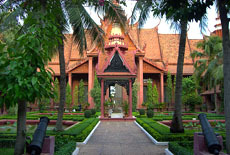 After breakfast, visit the traditional house at Phum Wat Kor and Wat Ek Phnom temple which was built in the 11th century during the reign of Soriyavaraman I (1002 – 1050), but now sits within the grounds of a modern pagoda. 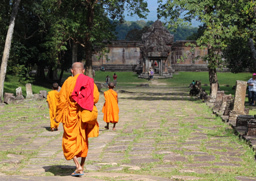 On the way back visit the Buddist temple Wat Slaket and Prahoc market where selling Prahoc - a kind of fermented fish paste which is a popular dish of Khmer people used for adding in cooking to make dishes salty or eat alone. Morning departure to Pursat Province, famous for its marble stone carvings, colonial architecture and floating market, continue to Kompong Chanang province (100km north of Phnompenh) - a centre of pottery founded some 5,000 years ago. The next stop at Phnom Oudong, the ancient Cambodian capital during the latter stages of the Khmer Empire and crowning site of many past kings. Consisting of a series of stupas atop a large hill, the site offers outstanding views across surrounding plains. 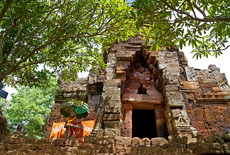 Phnom Oudong was bombed and desecrated by the Americans and then the Khmer Rouge, but still possesses a beauty that no war has been able to destroy. Overnight in Phnom Penh. Visit the old bridge in Kampong Kdei en route. 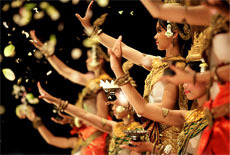 Enjoy Aspara dance show at night. 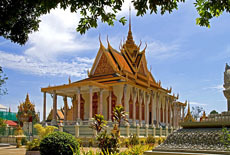 Battambang highlight exploration: traditional house Phum Wat Kor, Wat Ek Phnom temple and Bamboo Railway Station.